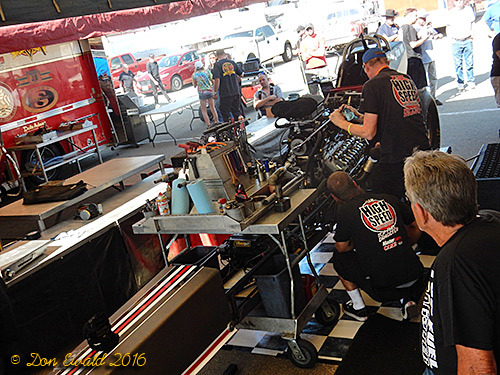 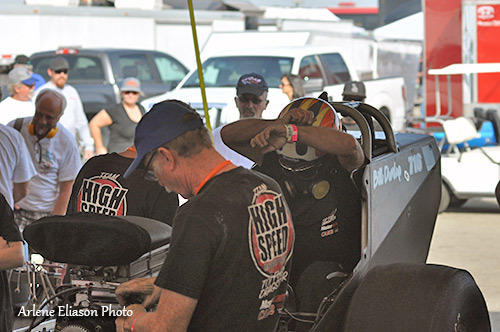 After sitting out the season following an accident at the 2016 March Meet, High Speed Motorsports retuned with a vengeance. 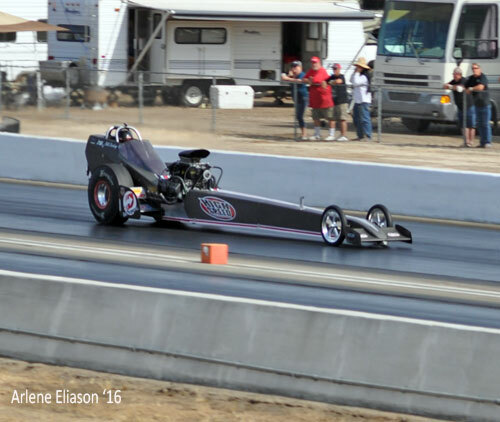 Team owner and tuner, Tom Shelar and brother Rick picked up the new car in late September from Brad Hadman in Washington giving them only 3-4 weeks to finish it up and get it race ready for the CHRR. 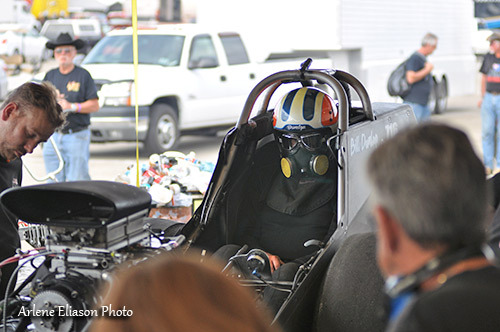 Arriving on Thursday the car was the talk of the Top Fuel pits. 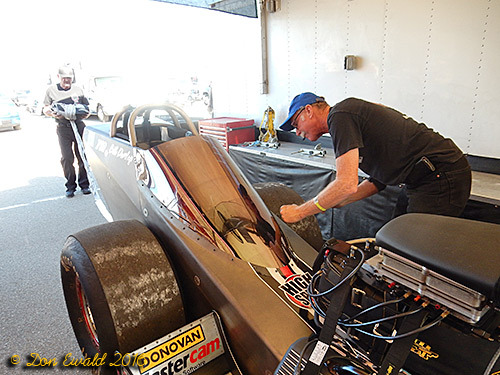 Hadman incorporated several "Big Show" techniques into the chassis including a very trick steering system, and a windscreen that allows driver Bill Dunlap a better view and protection from oil. 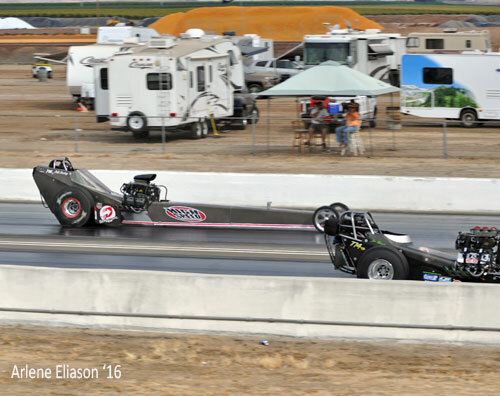 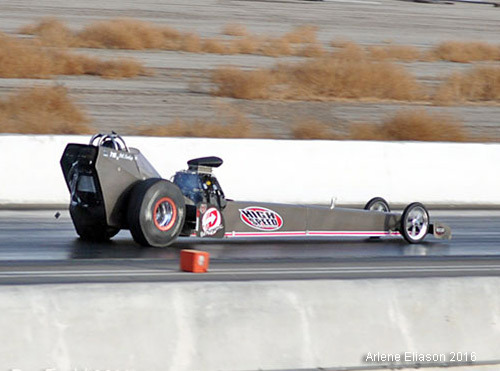 A magnesium body was added leaving the car over 100 pounds lighter than the old car. 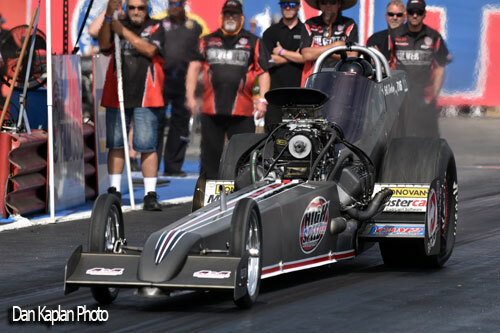 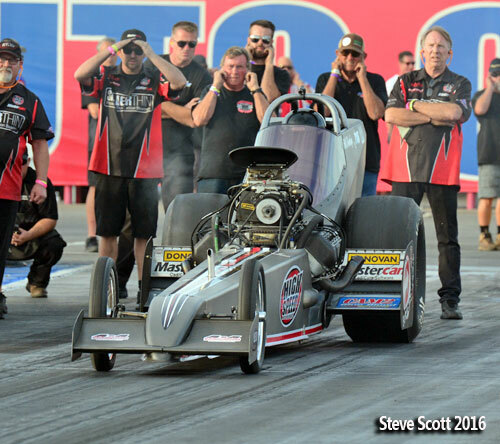 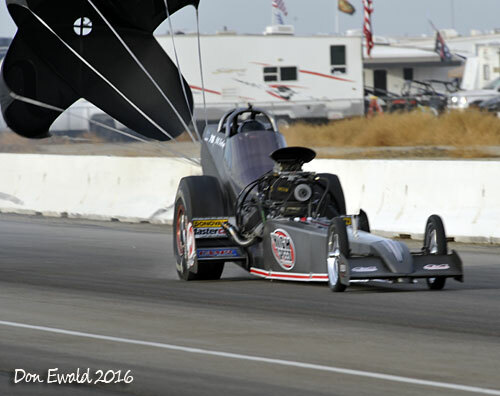 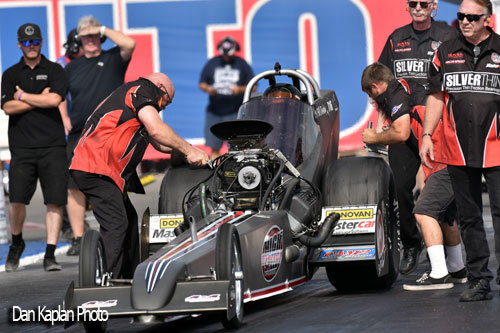 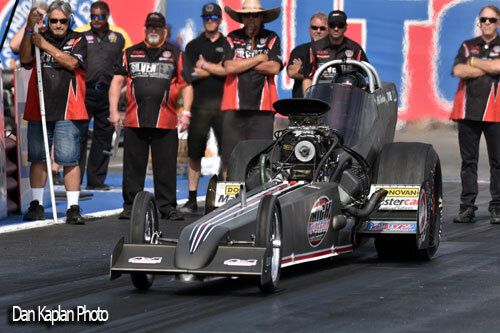 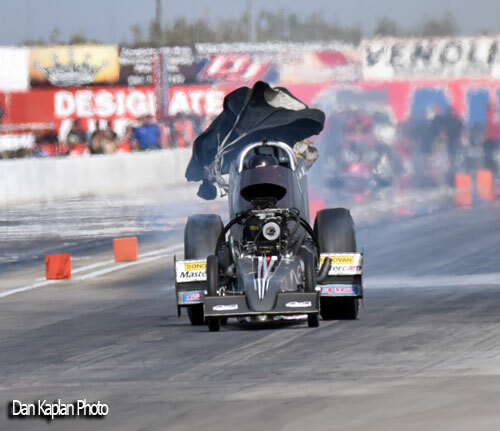 Graced with 4 days of Chamber of Commerce weather, Shelar made baby steps with the car running quicker and faster every pass until at the end of qualifying Dunlap was the #3 qualifier with a sterling 5.652 at 250.51. 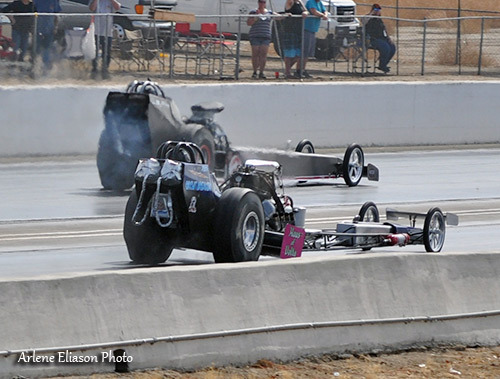 It was only a hole shot loss in the semi finals that kept the debut car out of the final. 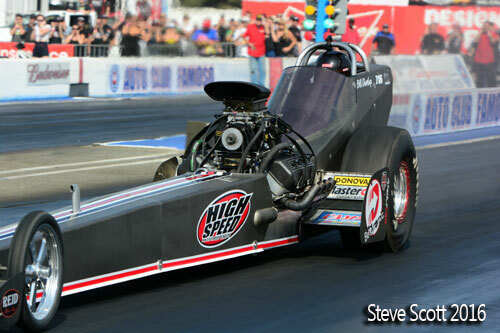 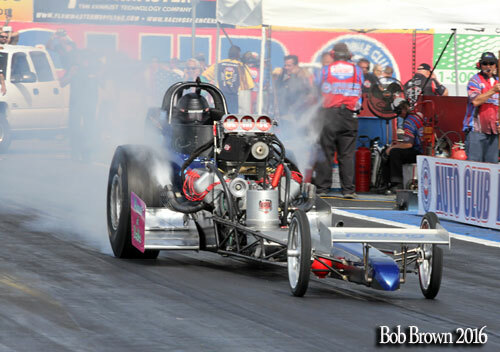 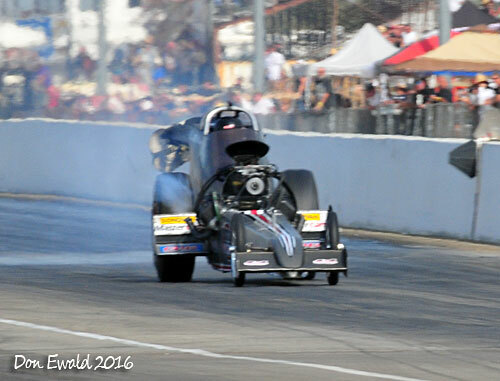 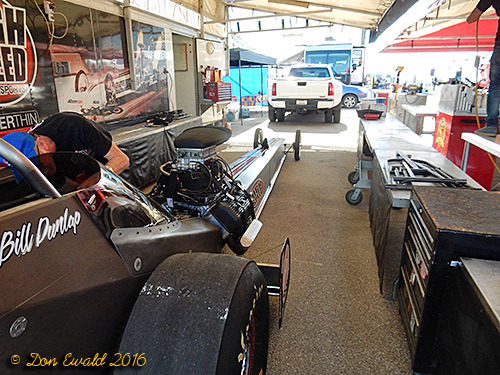 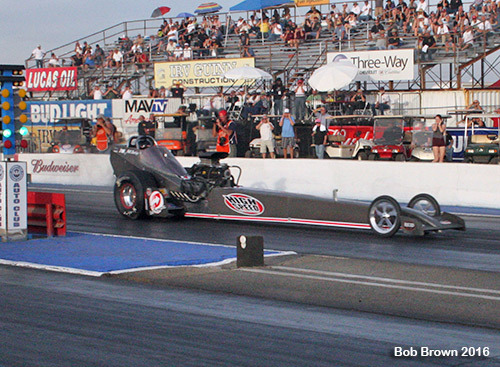 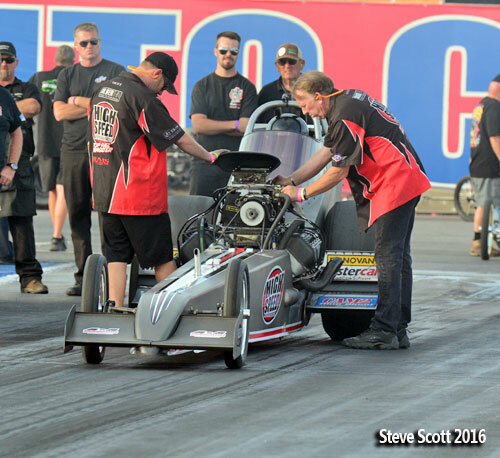 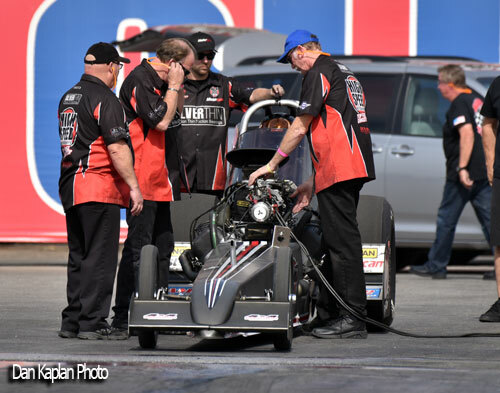 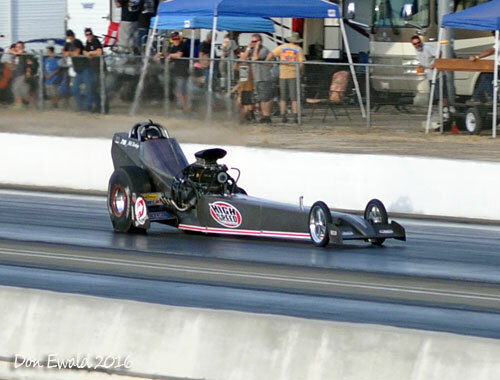 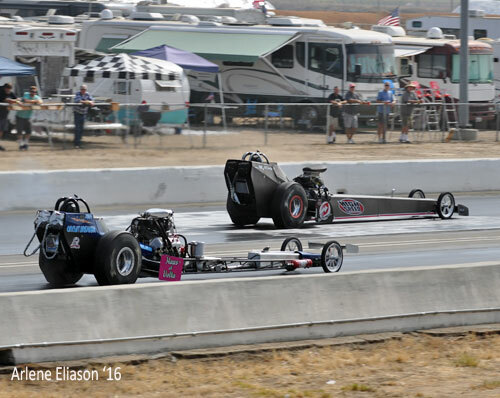 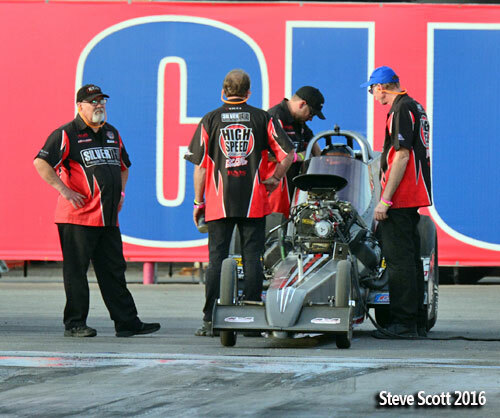 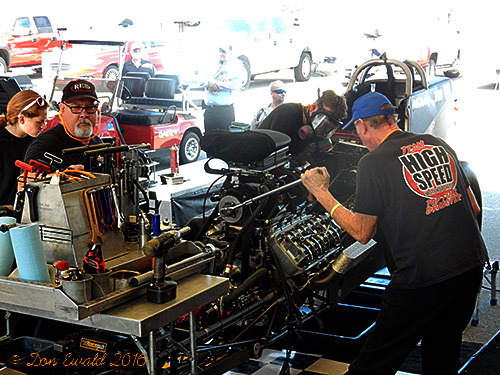 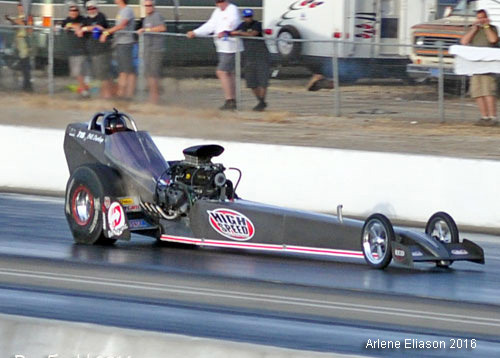 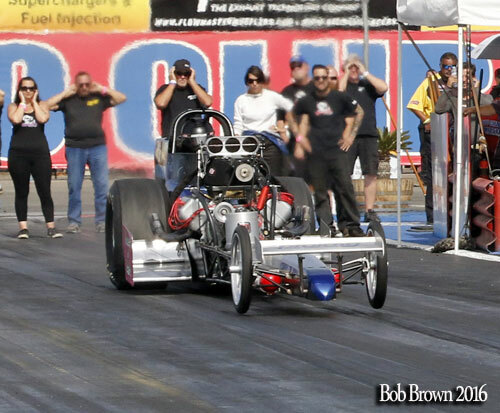 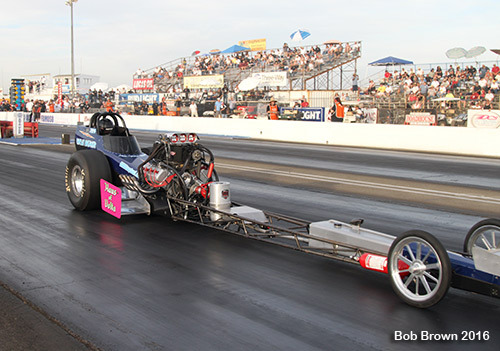 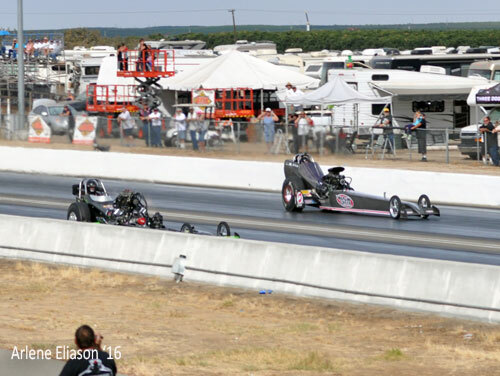 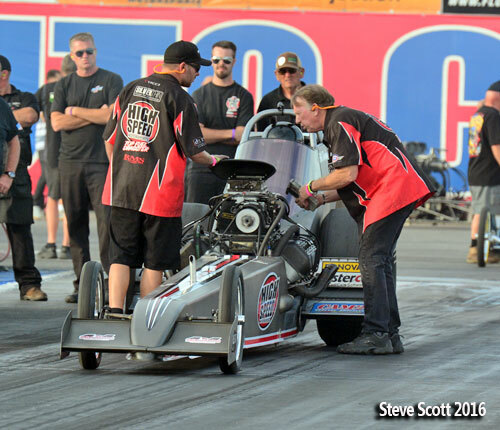 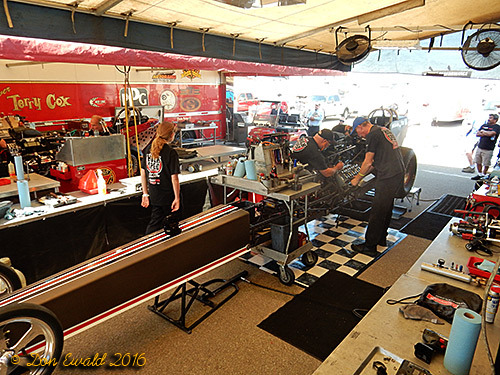 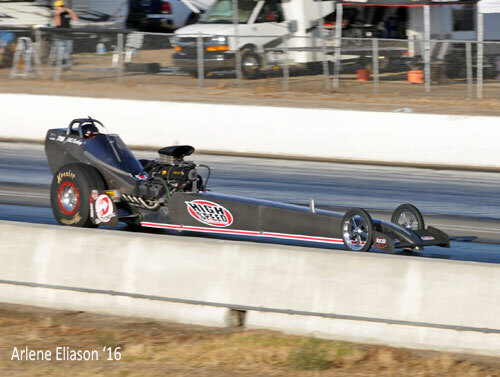 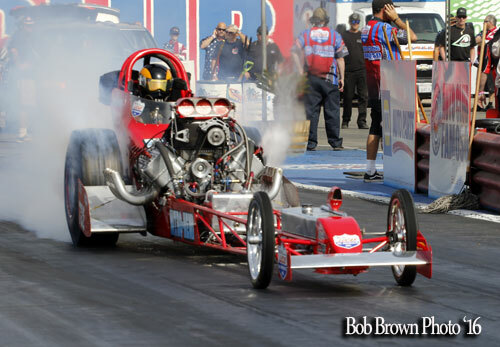 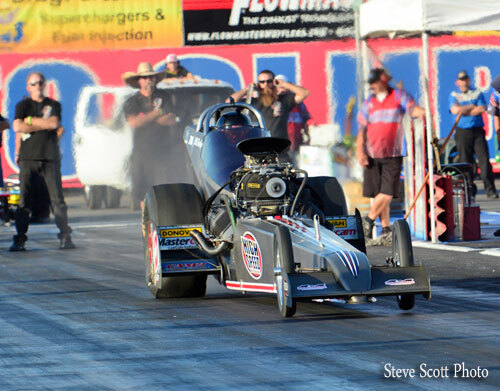 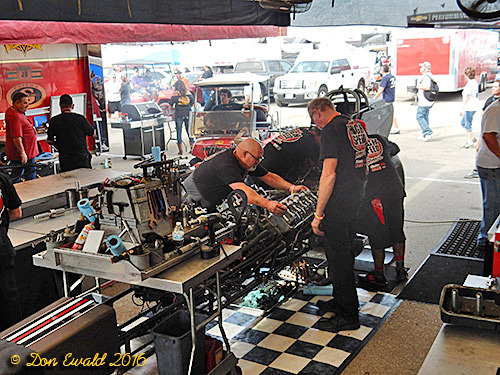 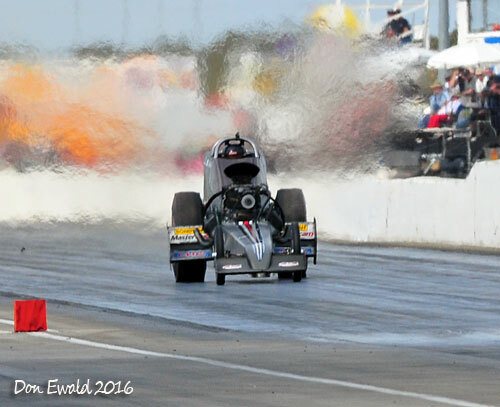 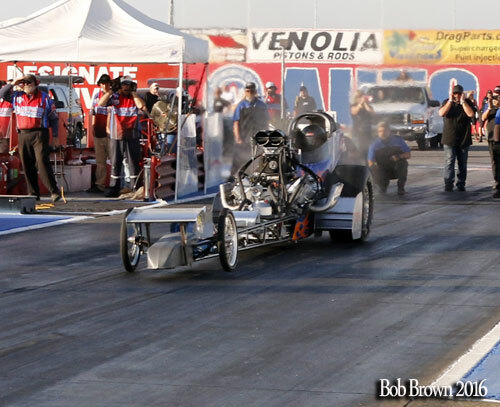 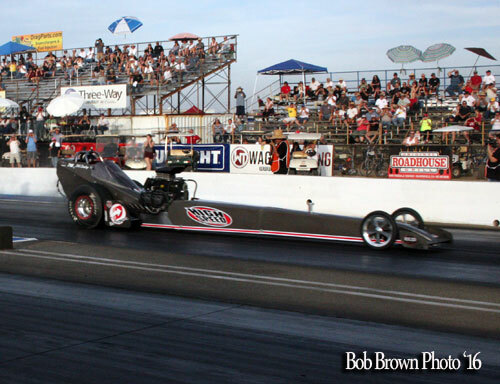 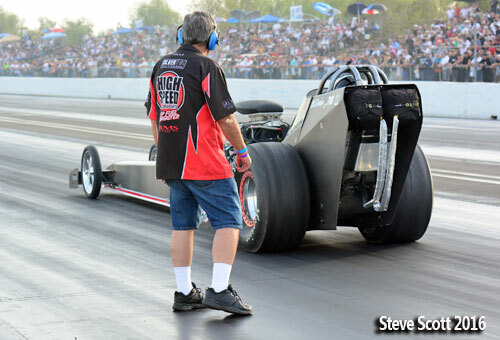 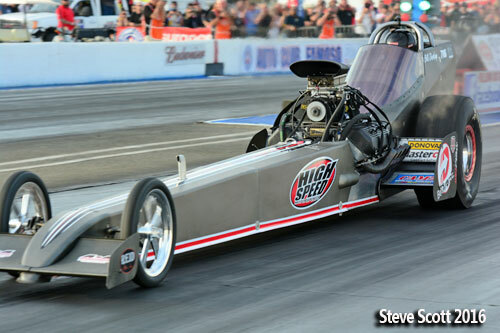 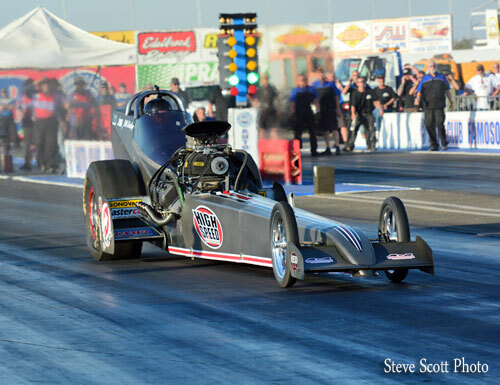 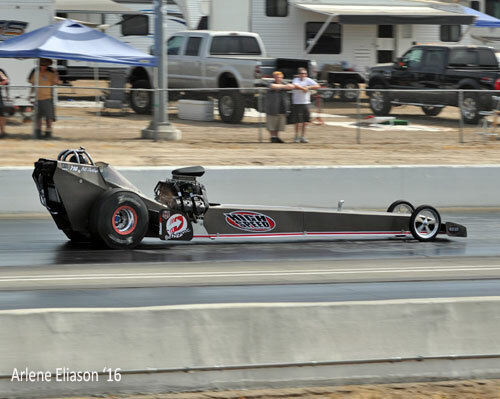 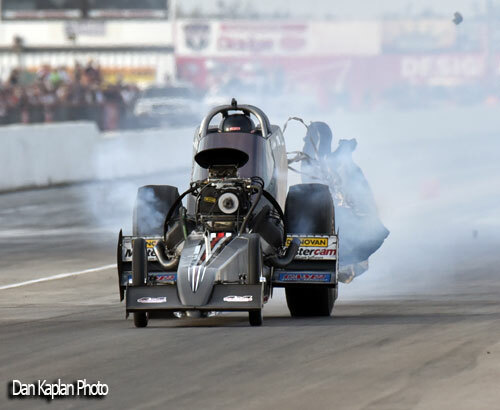 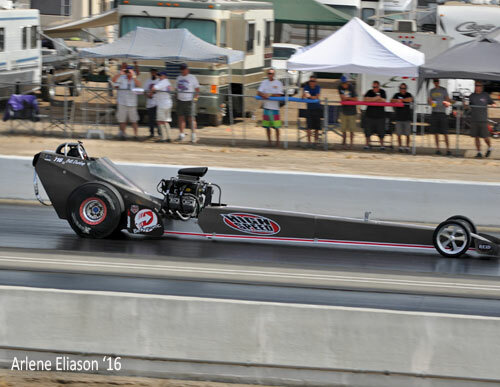 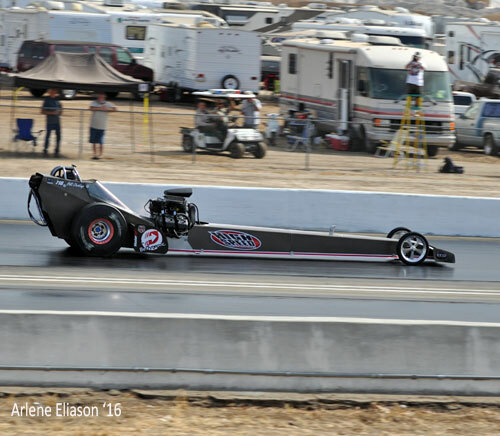 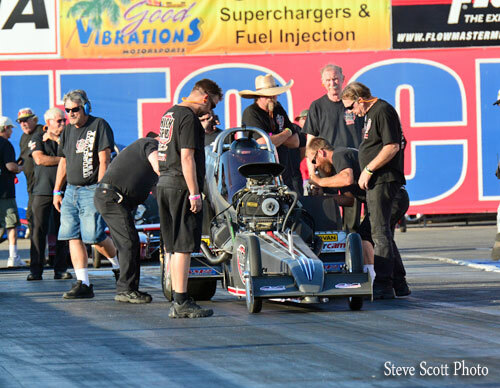 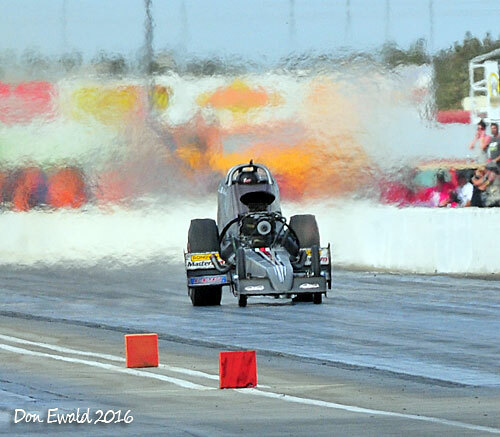 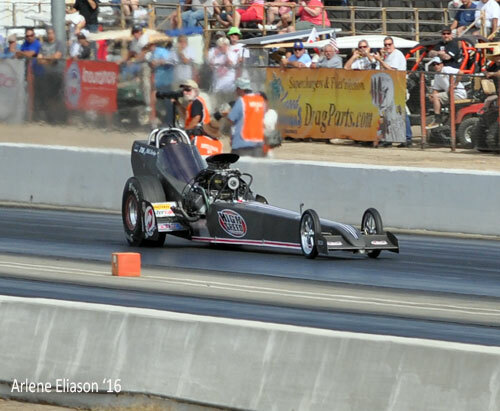 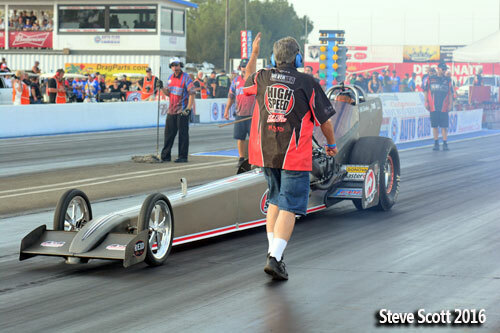 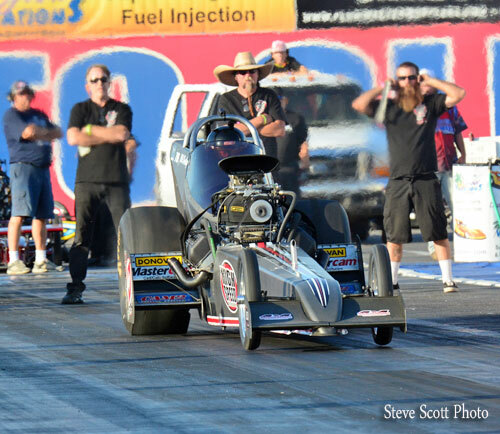 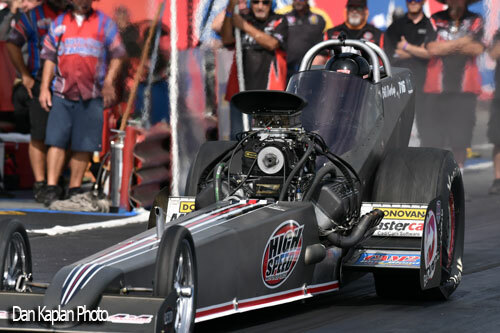 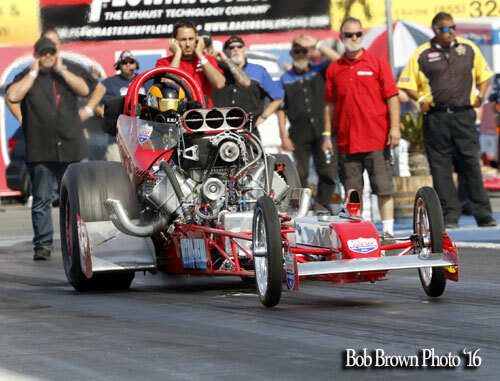 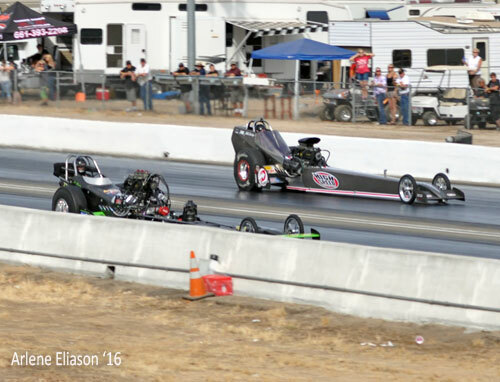 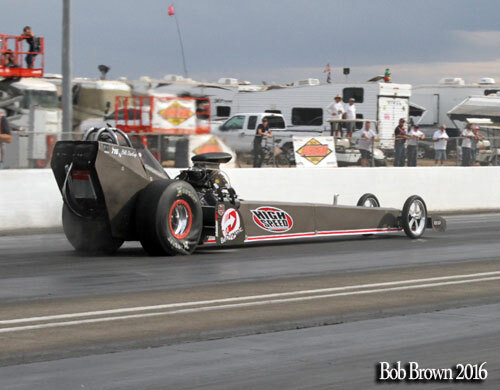 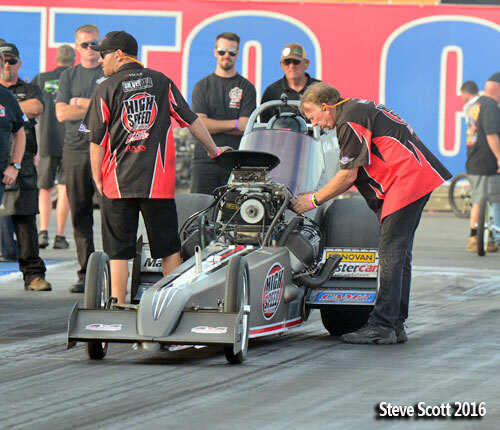 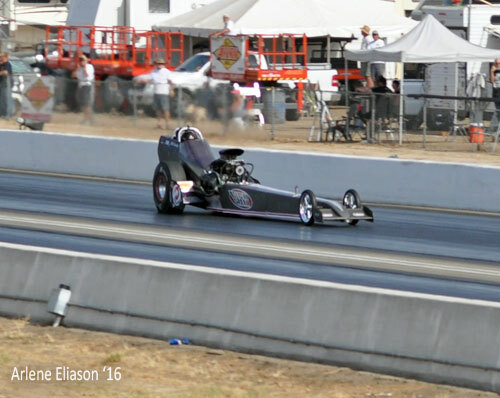 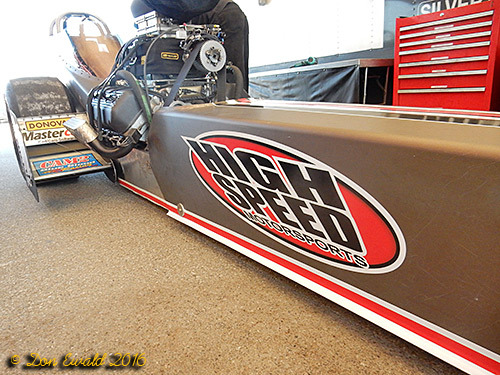 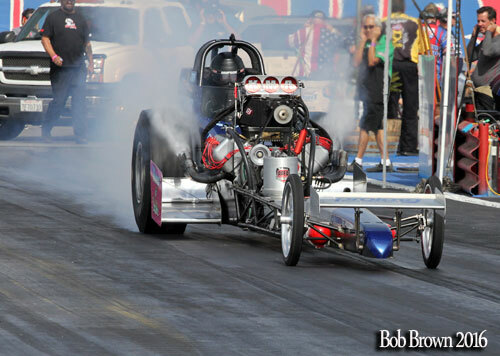 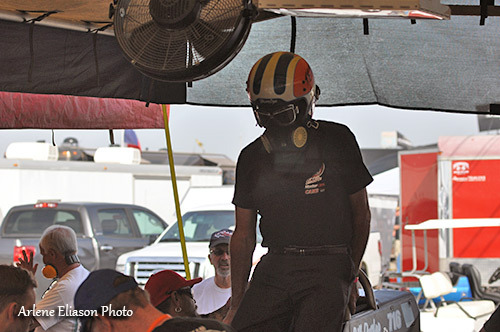 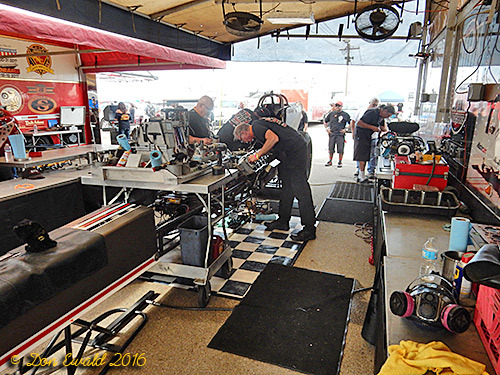 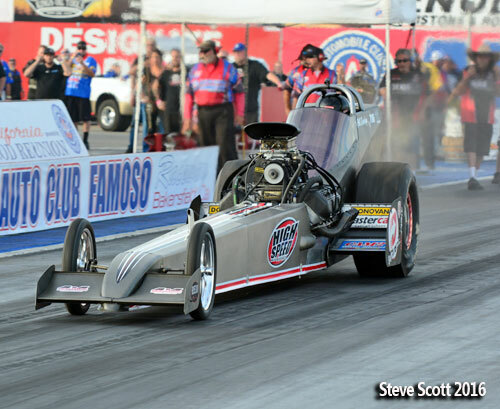 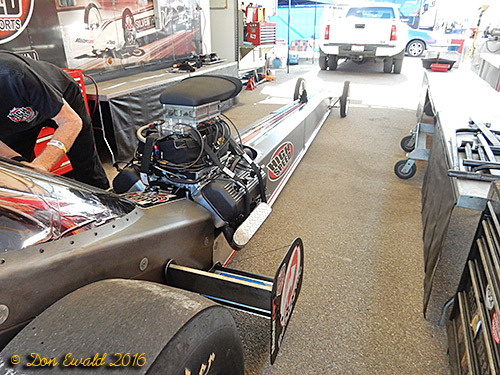 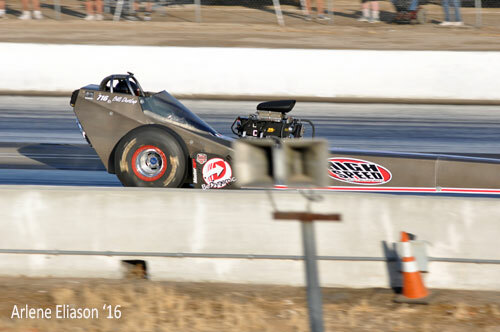 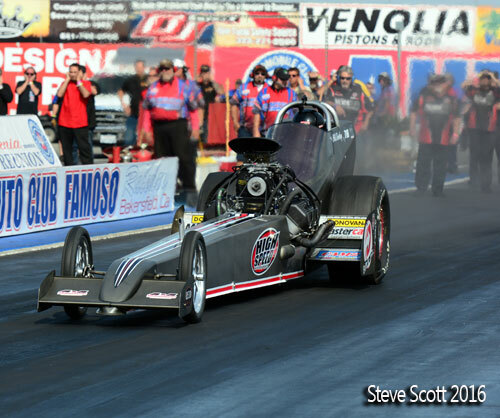 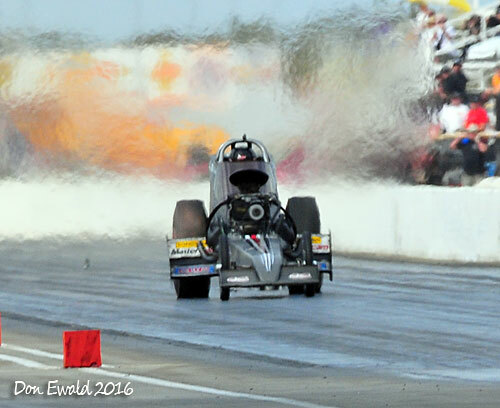 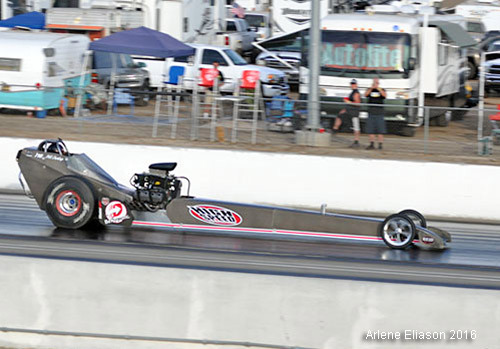 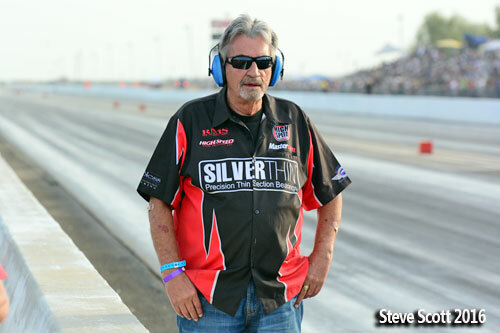 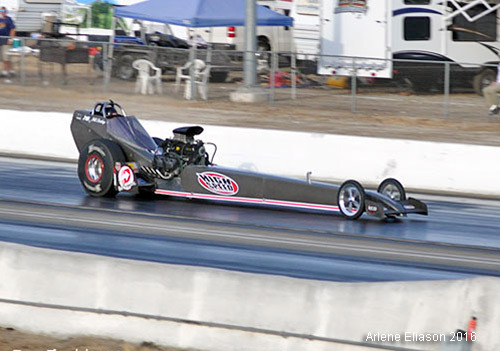 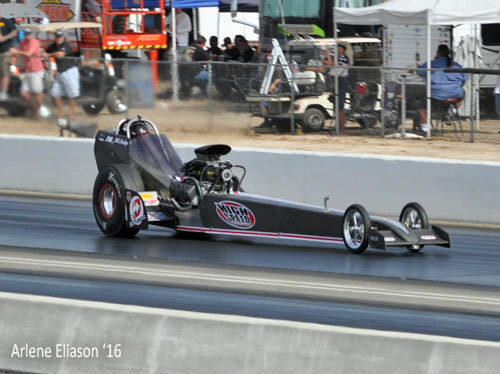 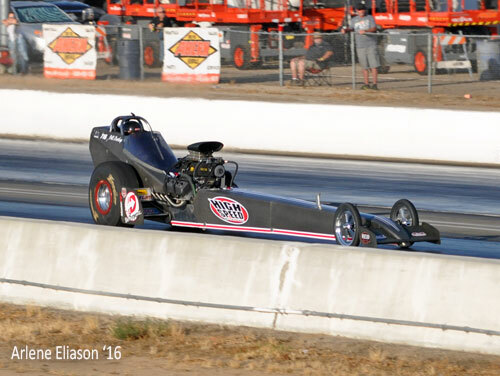 However, in the process Dunlap made the quickest pass ever in a HSMS dragster, his losing time was 5.617 at 257.63. 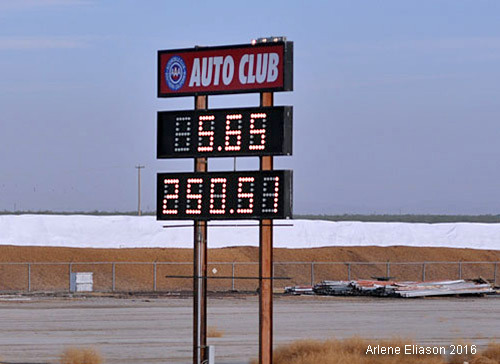 Shelar was all smiles stating, "The new car did everything we asked it to do. 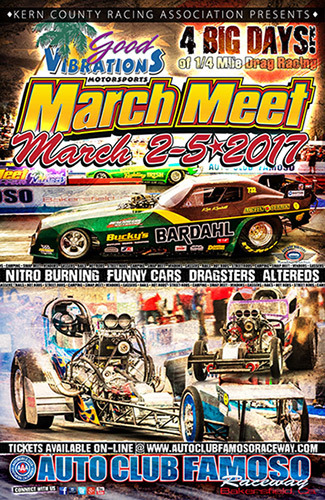 All five runs were solid and we can't wait for the March Meet". 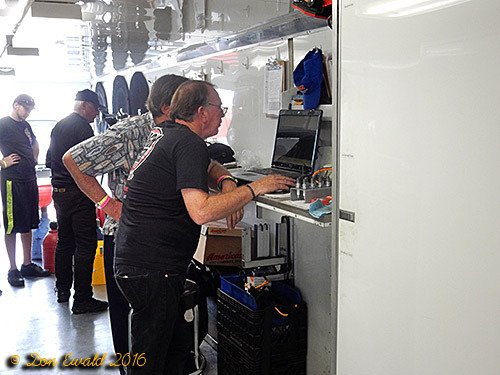 Thursday was spent finishing up loose ends (like the windscreen) and double checking everything. 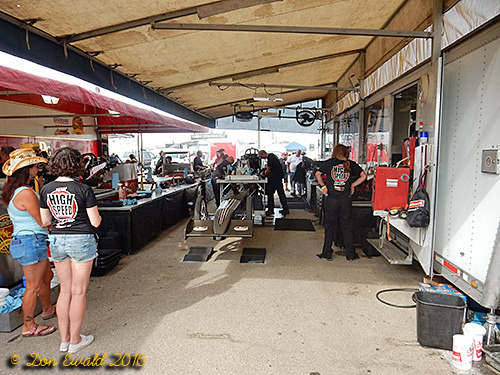 Friday getting ready for the first qualifying session. 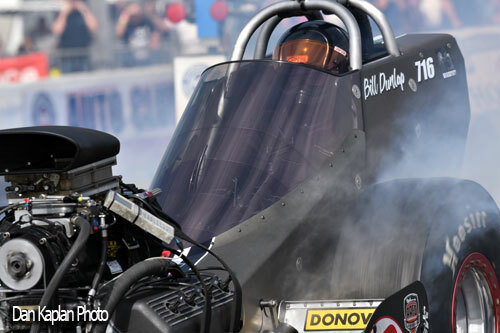 On Friday afternoon in the first qualifying session and the first run on the new car, Bill Dunlap was paired with the 2016 March Meet winner, Rick Williamson in the Craig Racing fueler. 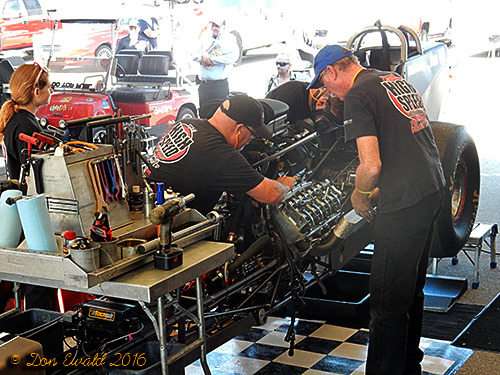 Tom Shelar and Sean Bellemeur made the final adjustments. 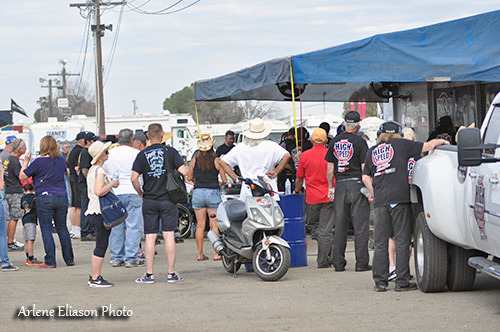 The early numbers were more than encouraging. 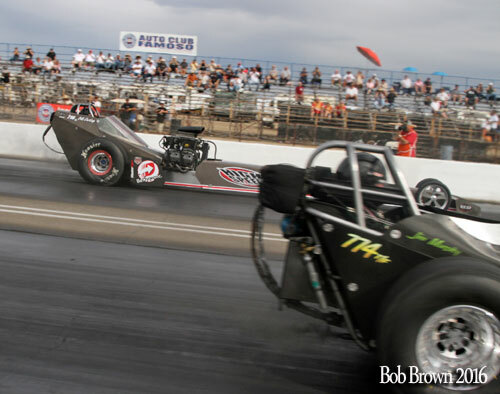 The maiden voyage was a planned 900' shut off for Dunlap. 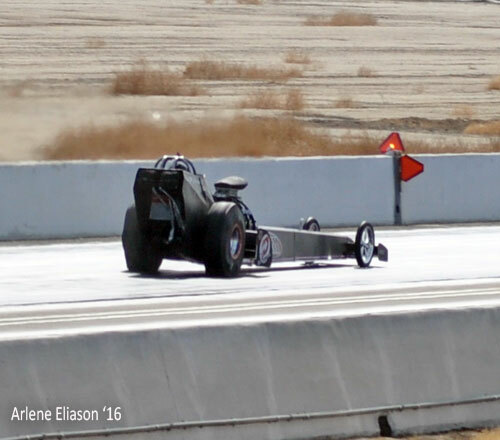 The car did everything it was supposed to do running a 6.009 at just 189.23. 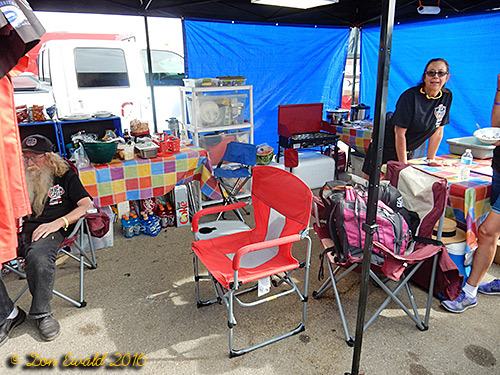 The cars behavior and data told owner Shelar that this was going to be a fun weekend. 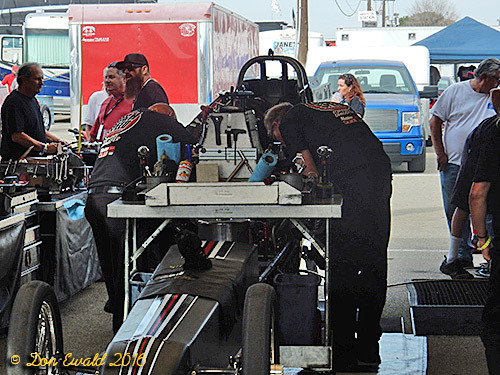 Getting the car ready for the second session on Saturday. 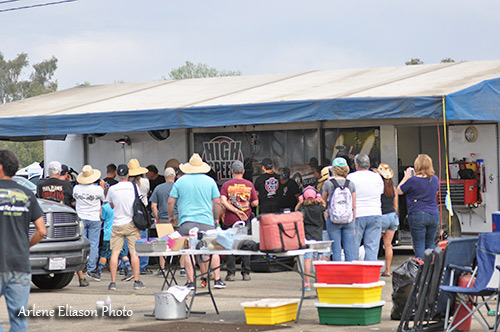 The HSMS hospitality area is quite popular and the girls always have something to munch on or drink. 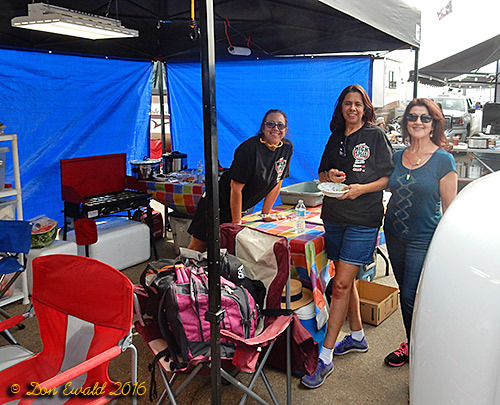 Here we have Maria Stevens, Tami Russell and Mary Dunlap. 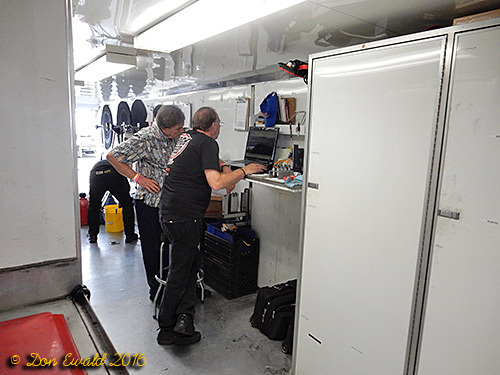 Tom Shelar and Tim Gibson went over the data from the first run. 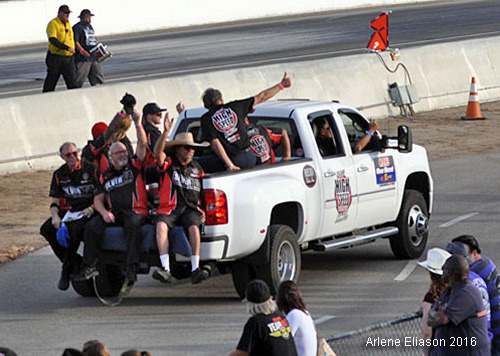 Al Renteria Jr. is the offical move-the-car-around driver. 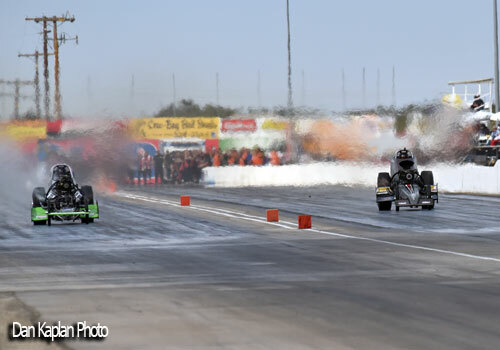 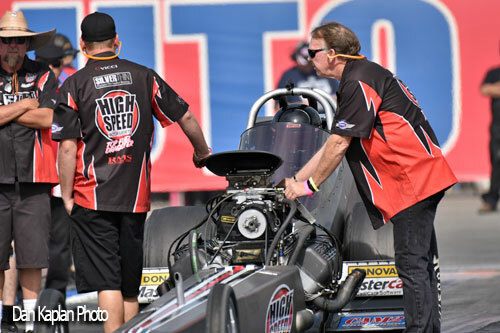 Nitro Saturday opened up with the second session of Top Fuel qualifying pairing Bill Dunlap and Pete Kaiser in the Circuit Breaker. 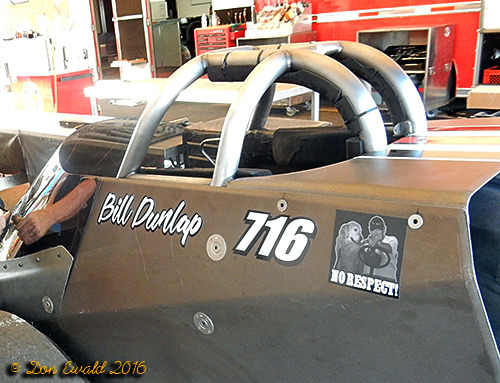 Again Dunlap had great early numbers. 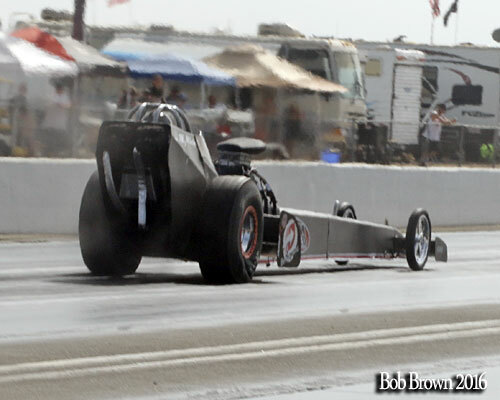 On only the second run in the new car Dunlap improved with a solid 5.72 at only 223.02. 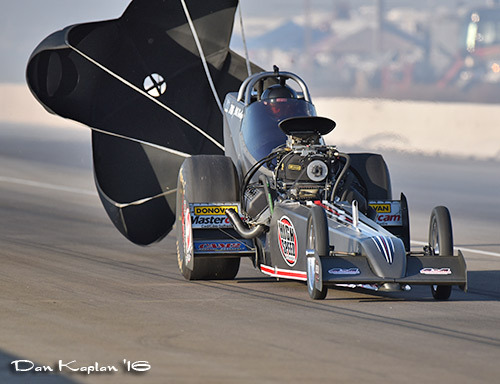 Once again Dunlap was paired with Pete Kaiser. 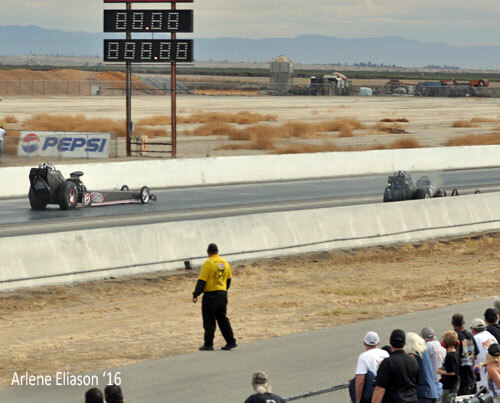 Kaiser faltered off the line and appeared to just coast through. 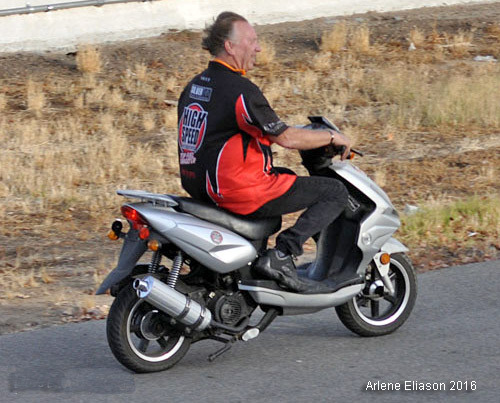 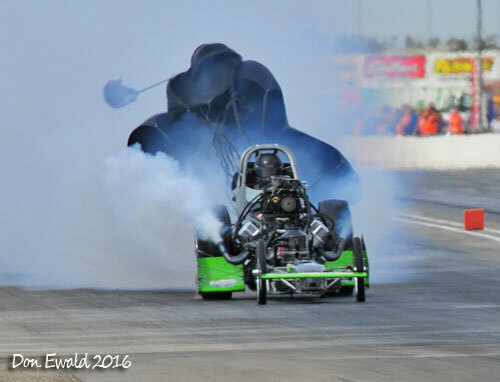 Both went green, so it must have been a mechanical problem as there wasn't any visible tire smoke. 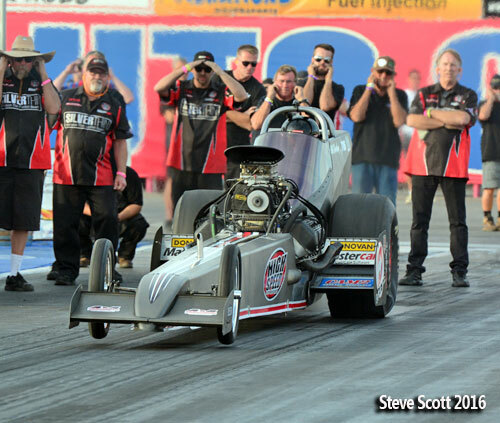 The first full pass through the lights was a solid 5.652 at 250.51 and that told Tom and the gang that they had a major player. 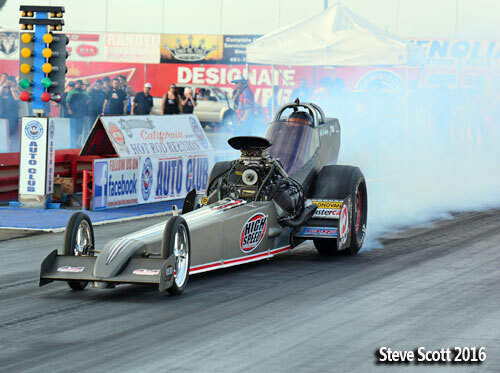 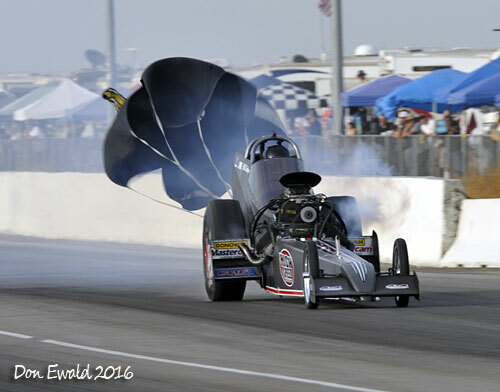 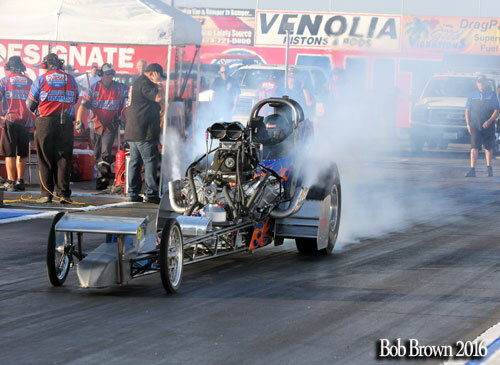 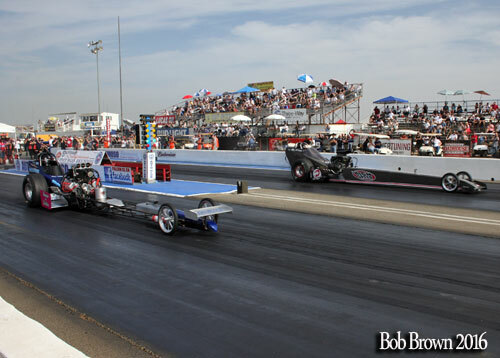 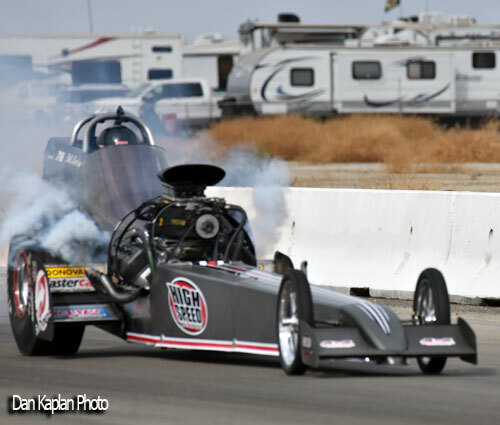 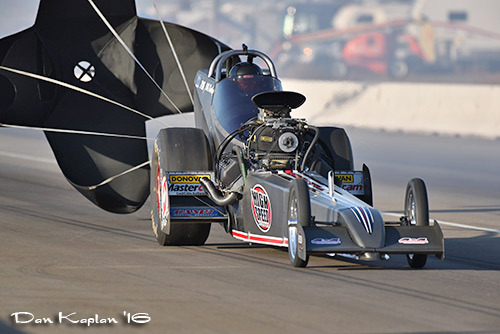 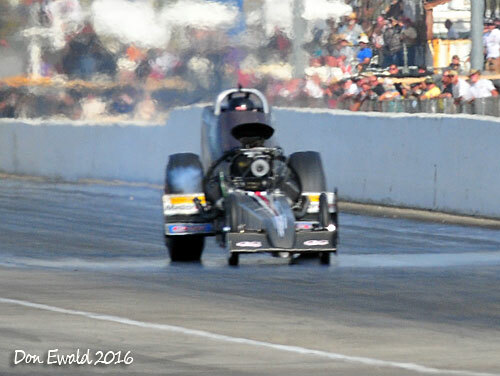 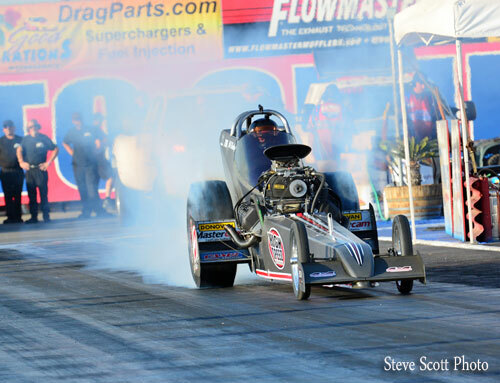 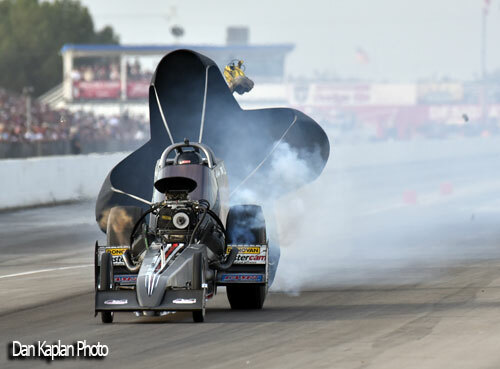 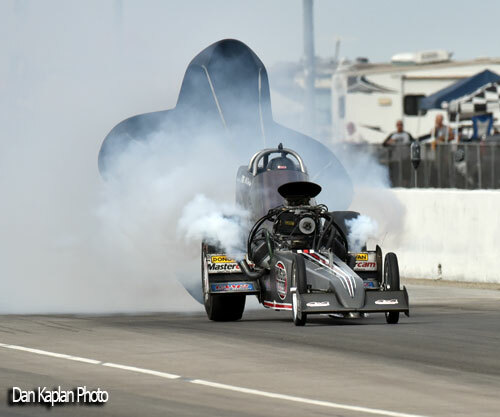 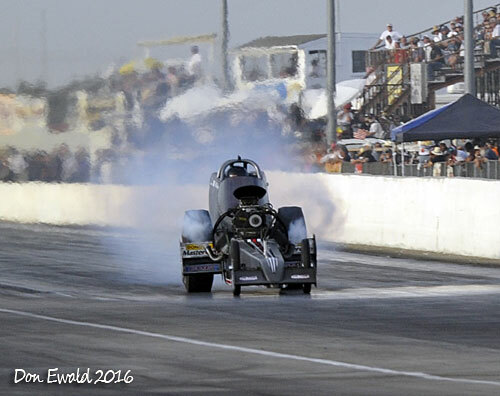 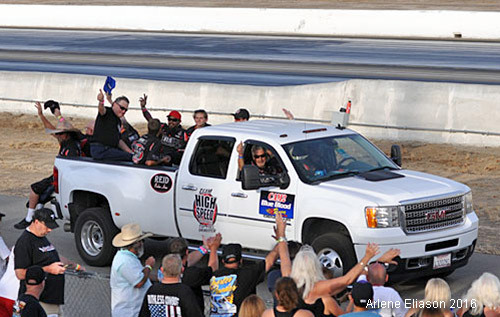 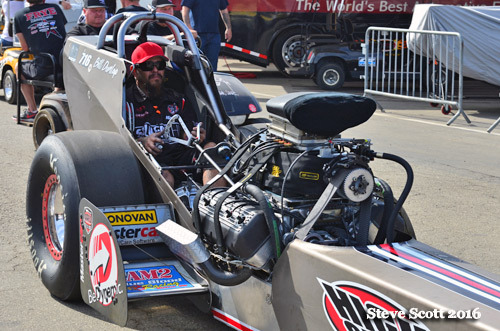 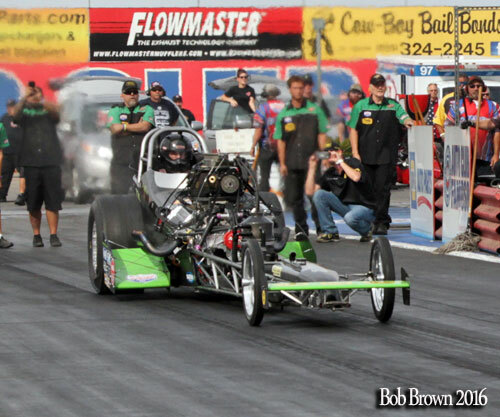 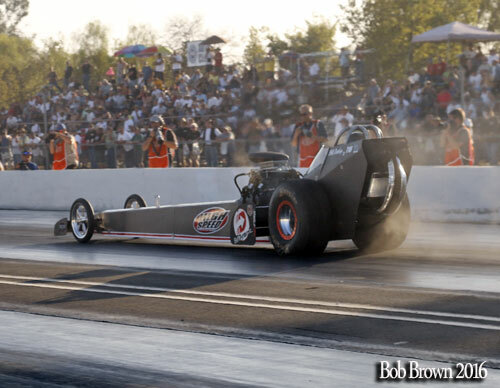 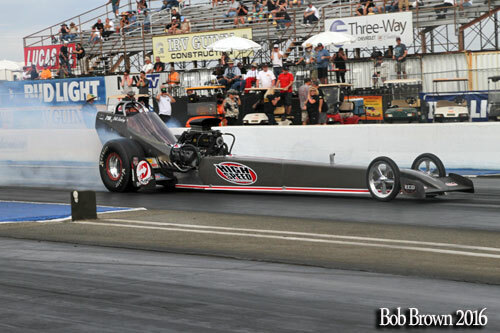 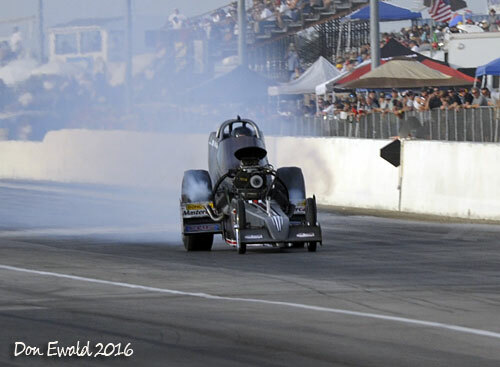 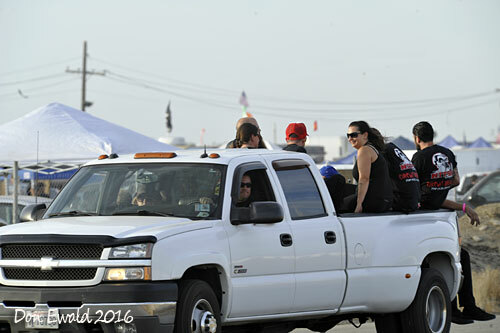 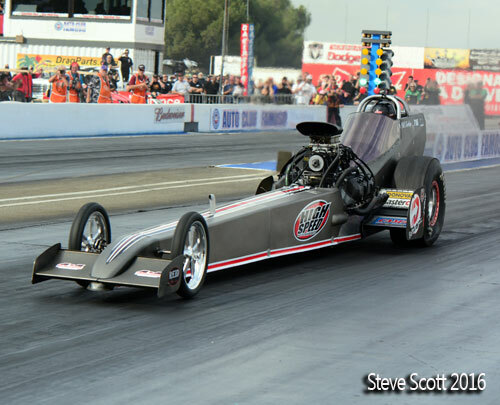 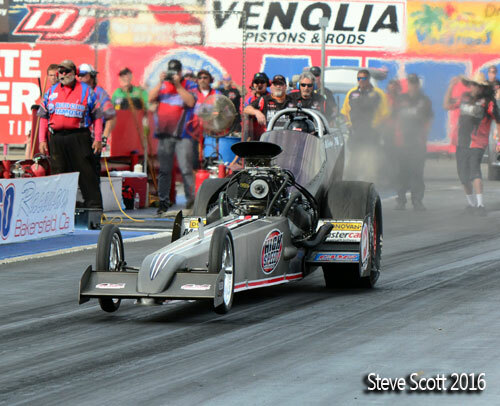 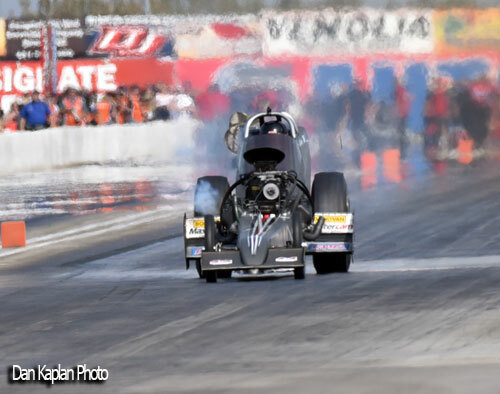 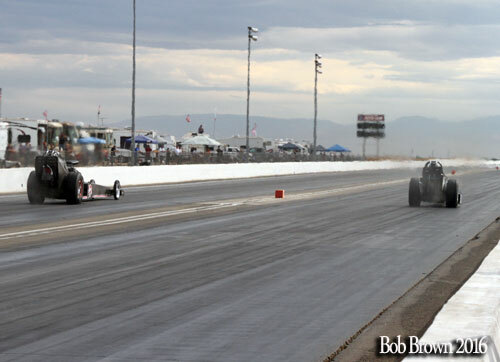 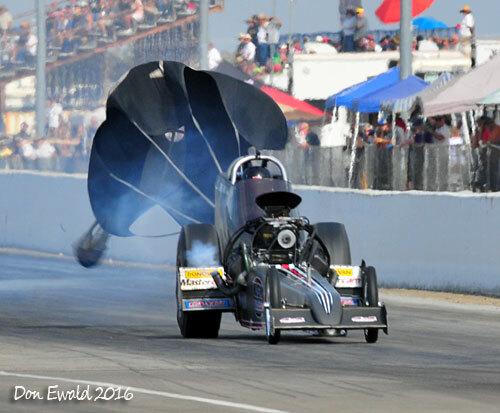 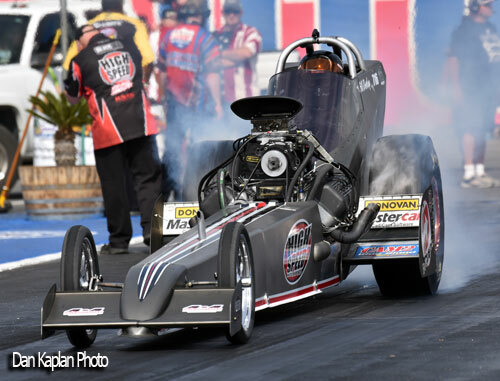 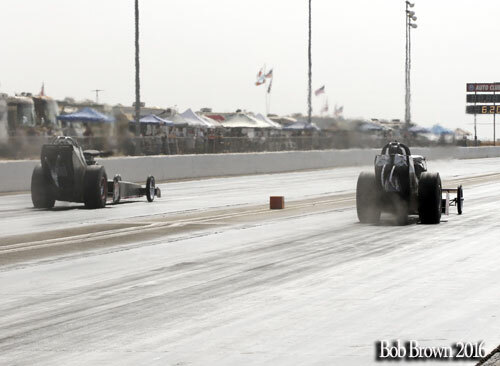 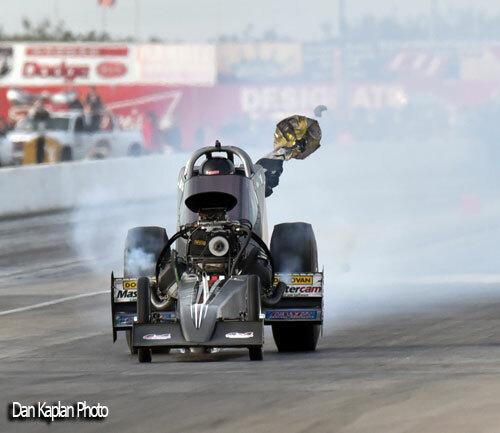 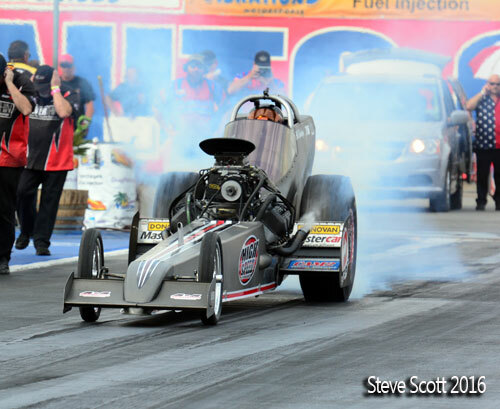 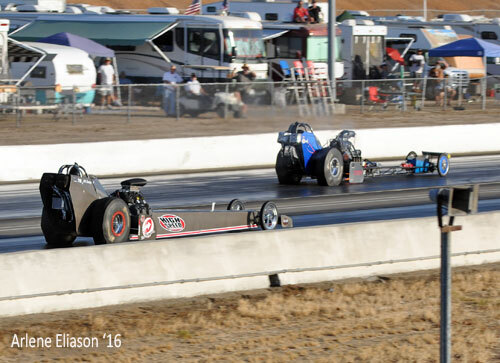 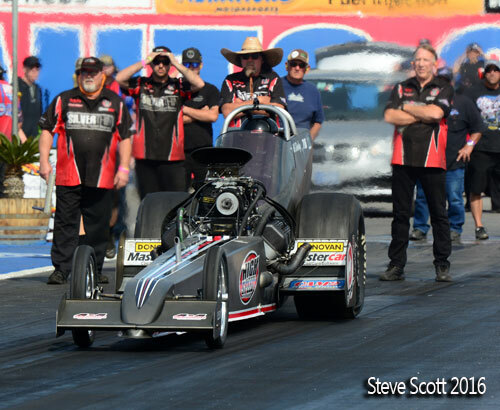 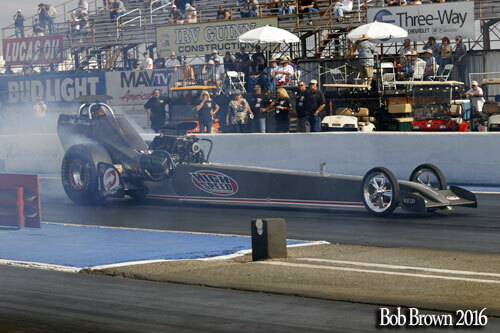 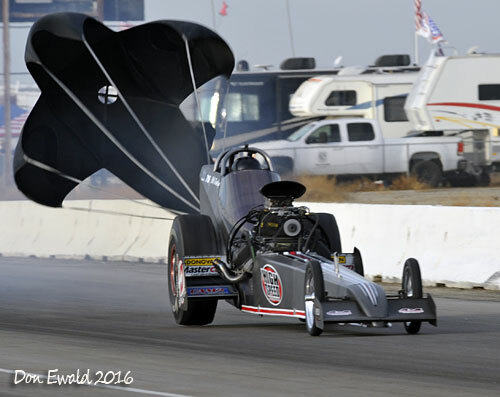 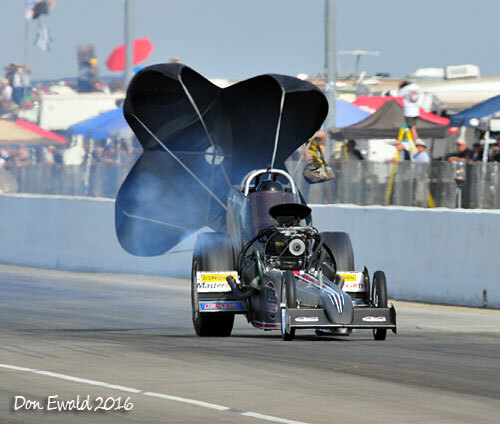 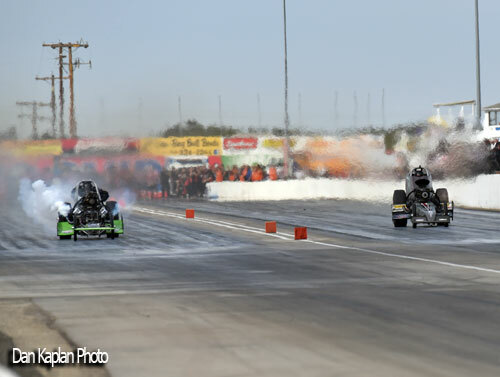 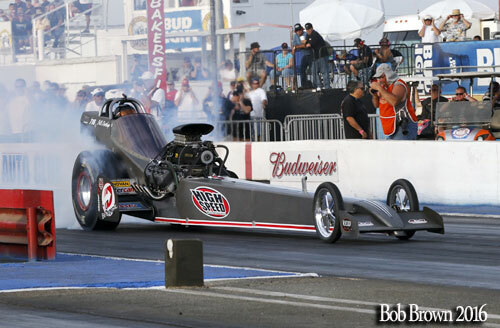 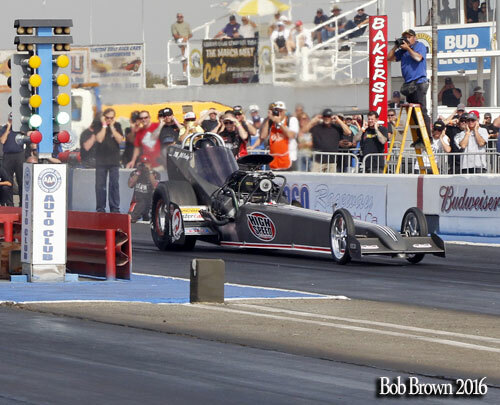 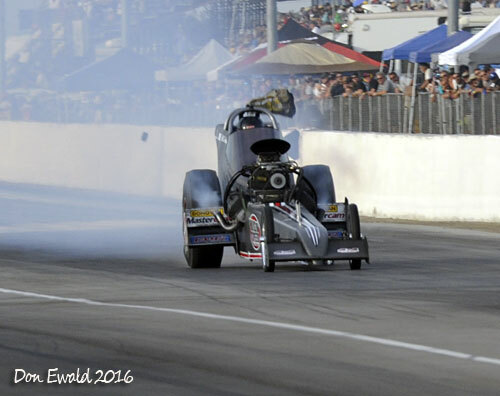 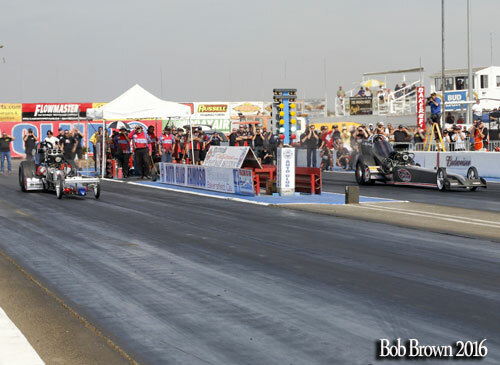 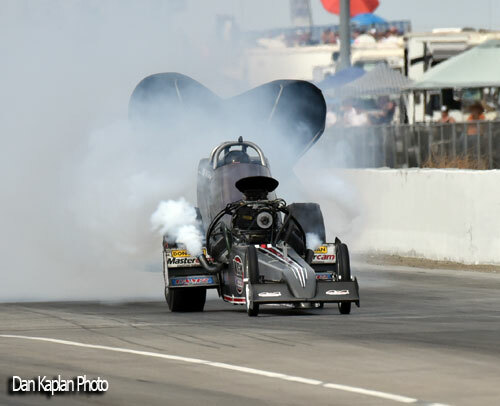 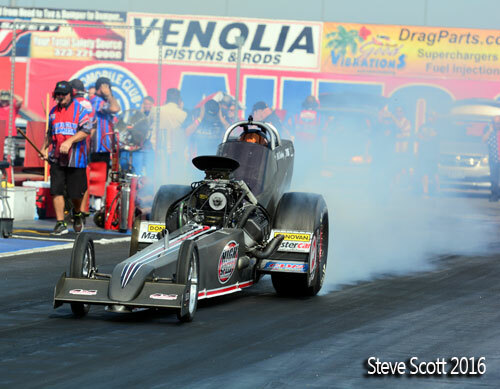 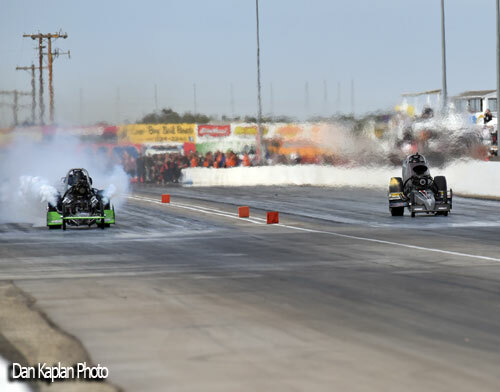 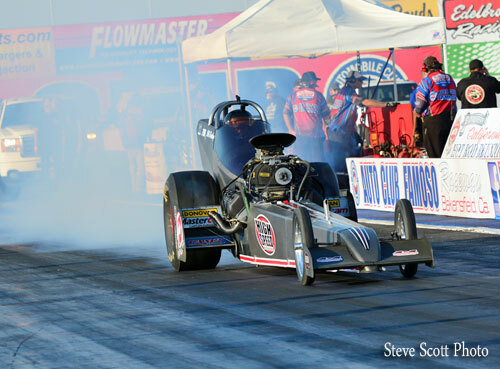 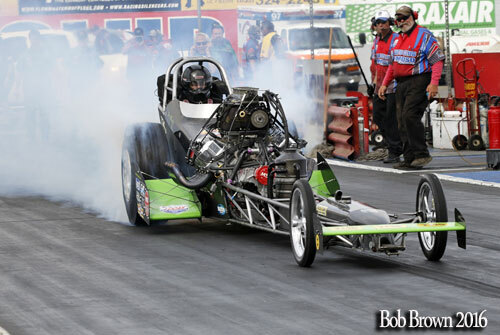 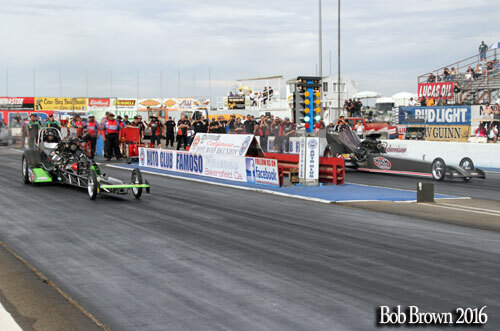 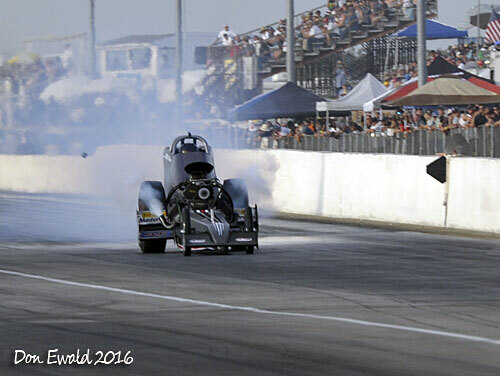 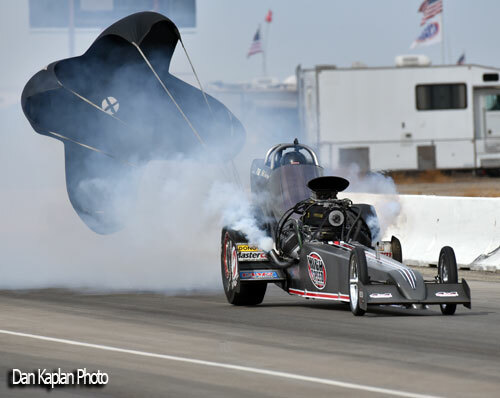 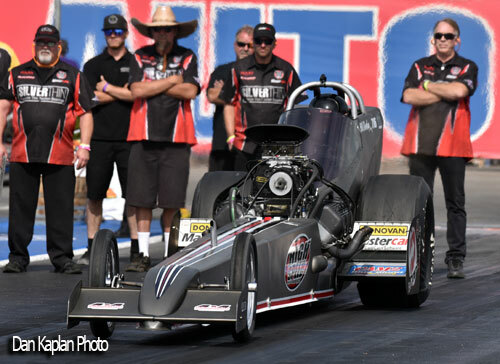 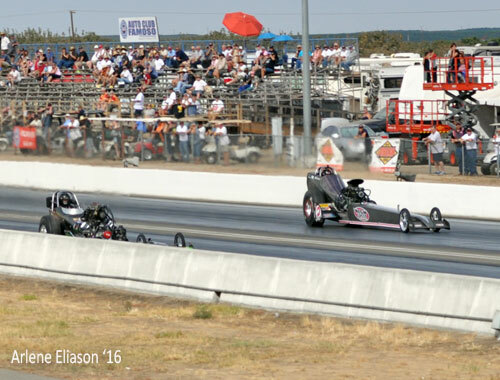 Top Fuel elimination kicked off Sunday morning after the pre-race ceremonies. 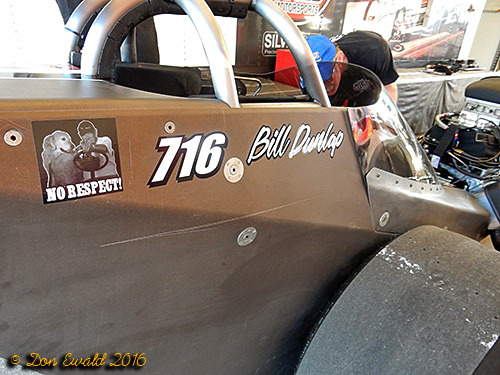 First pair out was #3 Bill Dunlap and #6 Dusty Green. 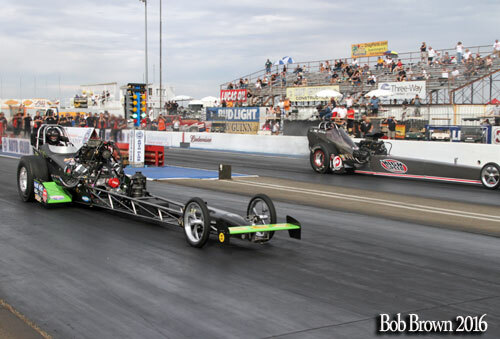 Green got a starting line advantage, but was off the throttle before the 60' block. 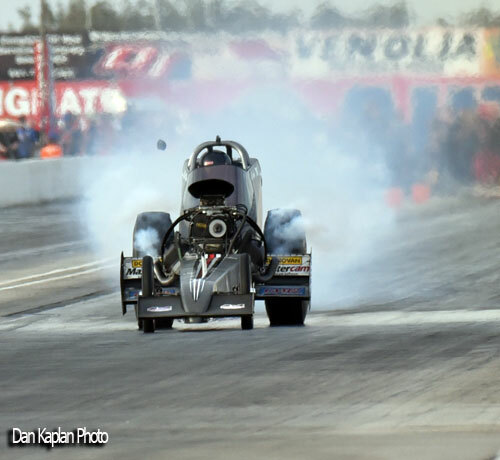 Dunlap stopped the clocks with a 5.721 at 249.49 to move on to round two. 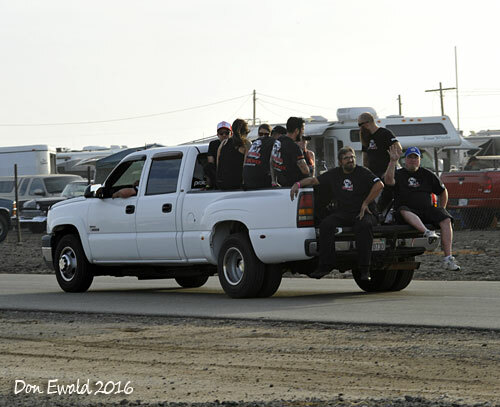 Between rounds the fans got to see the maintenance up close and personal. 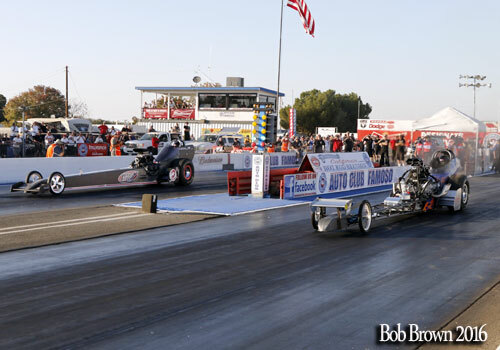 First pair to see who would go to the final was Bill Dunlap and Jim Murphy who are the two oldest drivers in NTF. 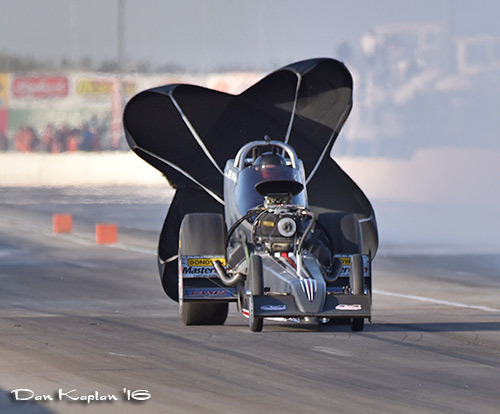 Murphy got a full tenth on the tree leaving Dunlap to play catch up. 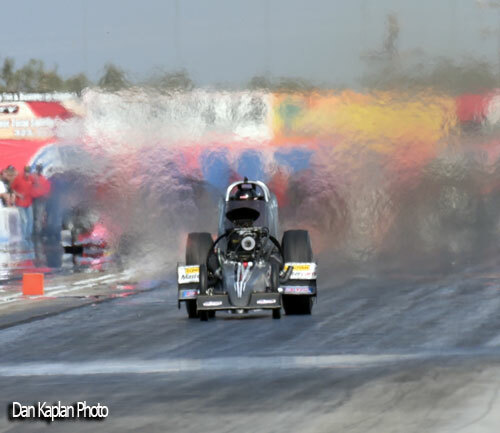 In the traps, try as he did, Dunlap could not overcome the early deficit. 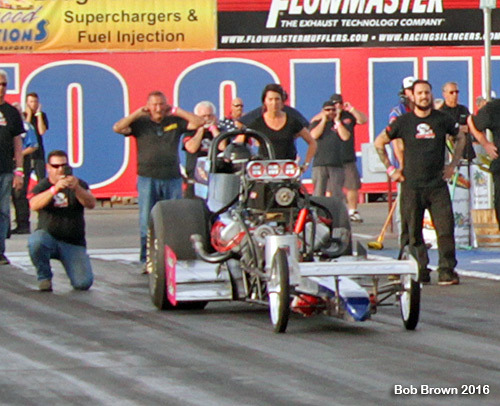 Murphy carded a 5.642 at 245.18 holeshot win. 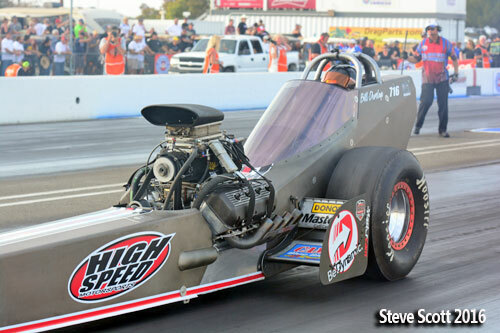 Dunlap ran 5.617 at 257.63 which was the quickest pass in High Speed Motorsports history. 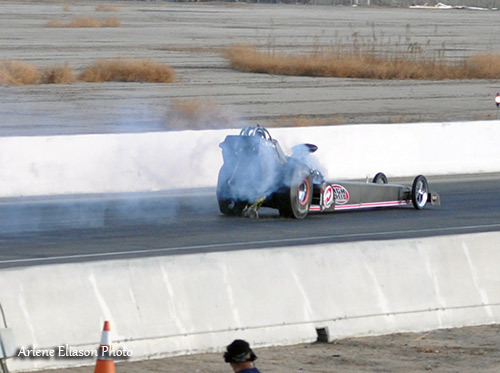 Murphy's MOV: 0.0660 seconds (approximately 25 feet). 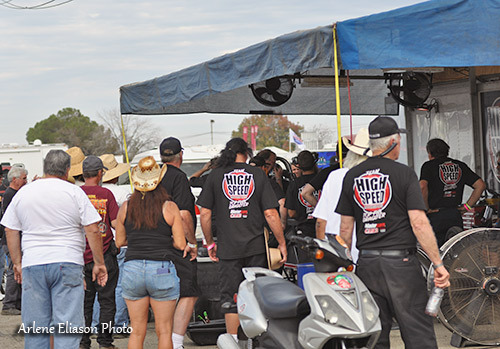 In spite of the loss, the entire HSMS team was very pleased with the new cars performance and can't wait for the March Meet. 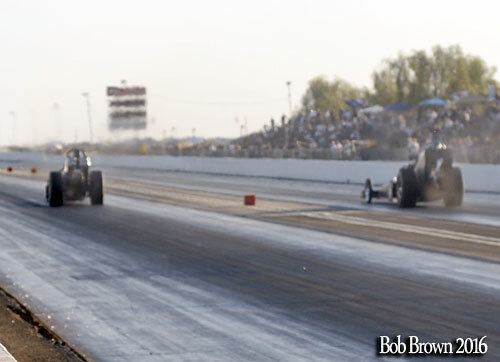 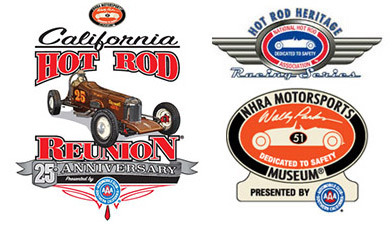 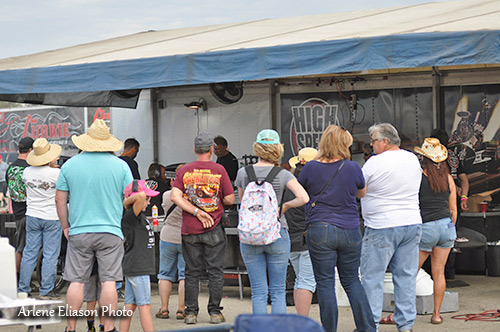 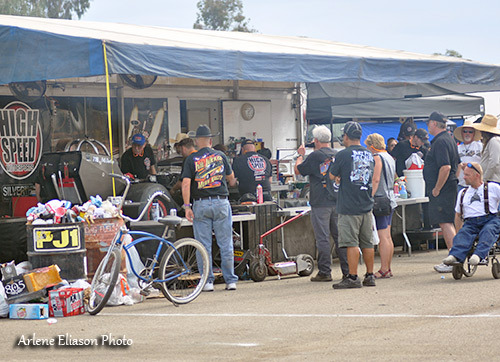 Plan to join us at the grand daddy of nostalgia drag racing.